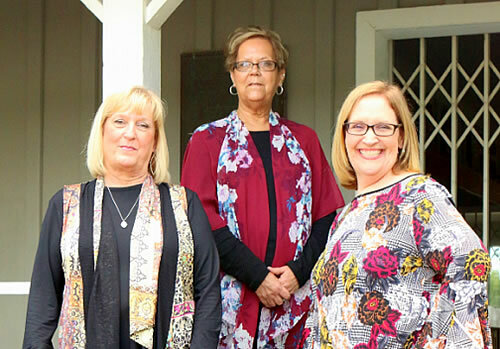 Trusting Hymn was formed in May 2000 in Royse City, a part of the Dallas Fort Worth Metroplex area. Its members have been in southern gospel music for many years, and they are all excited about how God is using the ministry for His kingdom. They are honored to be a part of the many miracles He has performed through Trusting Hymn. If you would like to host this powerful ministry at your next concert, church service or women's event, contact Beverly at the number listed at the top of this screen today! You can trust Trusting Hymn to bring a powerful message of hope, ministry and encouragement for any and all. The founding members of Trusting Hymn are Marilyn Calder, Janet Gentle and Janey Tanksley. In March 2011, Beverly Neal joined the ministry and takes care of running sound for the group. Marilyn Calder sings lead and harmonies in the group. She has been singing since she was five years old. She and her sister grew up in front of the church singing with their mom playing the piano. Marilyn was born and raised in Mesquite, Texas and currently resides in Crandall with her beautiful daughter Heather and her two cats! Music has always been a major influence in her life. Marilyn says, "I have never been able to shake the call of God on my life to be out ministering to other people. The Lord blessed me with the privilege of being a part of this group and the honor of singing with people who share the same heart for ministry as I do." Janet Gentle was born in Dallas, Texas and was raised by two of the most loving and caring Christian parents anyone could ever ask for, Jonah and Vivian Denham. She's been married to her husband, David, for forty (40) years. David and Janet have three grown children, Steven, Tina and Daniel. God has also blessed them with seven (7) grandchildren. Janet sings alto for Trusting Hymn and simply loves to sing. She's been singing since she was very young. In her early years, she sang with the Pilgrimettes. In her teen years, she sang with the Harmonettes and later with the Jimmy Todd Trio. Janet also sang with the Denham Family, which was her dad and younger sister, Janey, who is also currently with Trusting Hymn. Janet says, "God has been so good to me and is blessing my life greatly every day. My God is real!" Janey Tanksley has been singing gospel music since she was old enough to talk. She's always sang with her older sister and best friend, Janet. That is how she met her loving husband, Gary. It was through marriage that she became an aunt to Marilyn Calder, one of her best friends. Gary and Janey have two wonderful sons, Billy and Jason, and daughters-in-law, Livi and Melissa. Livi and Billy have a daughter, Emma and two sons, Brett and Kyle. Jason and Melissa have twin boys, Camden, Hayden and Caleb. According to Janey, "When we are not ministering, I enjoy watching the grandkids play sports and cheering as well as spending time with my family. Please keep Janet, Marilyn, and myself in your prayers for our ministry." Truly, these three dynamic ladies join together into a ministry-focused group that is uplifting and encouraging to everyone they meet! Trusting Hymn, a dynamic, powerful ministry ready help you reach the lost and encourage the saved! Call them today!